Welcome to our Texas Alaskan Malamute Rescue Website! Celebrating over 15 Years of TAMR in 2018! Visit TAMR at NRG Houston Dog Show July 18-22! We are in Booth # 928, middle of the back row. There will be spokes-dogs at the booth Friday - Sunday, information on Mals and rescue, and a few donation items for sale. Stop in and say HELLO! 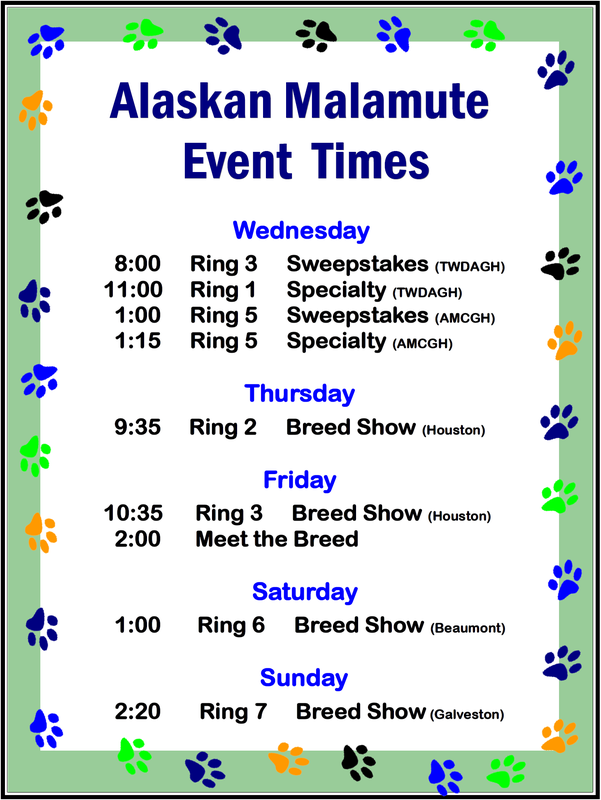 There will be Malamutes in the "Meet the Breed" ring on Friday, July 20 at 2 pm. Follow TAMR on Facebook! Click here to visit our page and become a fan! Come visit TAMR and our Malamutes at our local area events, or check out our hike & meet ups! Big wooo wooo's to all our volunteers and donors for their support of TAMR over the years! It’s time to enroll for the Kroger Community Rewards program to kick off the new accounting year! This year you can enroll online! Program information and easy enrollment instructions are found at www.KrogerCommunityRewards.com. TAMR’s ID# is 90118. This is an easy way to earn free money for TAMR. Just shop Kroger to help our rescue dogs! Be an Angel Paws Sponsor and help a TAMR rescue Dog! Non-Texas visitors may visit the Alaskan Malamute Assistance League (AMAL) website for local AMAL rescue affiliates and dogs, or find other rescue websites at our rescue resources page. © Texas Alaskan Malamute Rescue Association. All rights reserved. Disclaimer. Site courtesy of Texalmal.